Using natural skin care products is very important. The skin is the largest organ and absorbs almost everything you put on it! Make sure you recognize the ingredients in your skin care products as natural or learn what they are before applying. The National Institute of Occupational Safety & Health studies found over 800 toxic ingredients in body care products. Over 700 of them caused acute toxic affects and over 300 caused developmental abnormalities. These chemicals may absorb into your body and brain 3 times faster than water. The word “Natural” can be used by a manufacturer if only 10% of the substance is natural. NONTOXIC can mean up to ½ of the animals tested in a lab died within 2 weeks. Baby shampoos that state “no more tears,” may have added anesthetics to prevent feeling the burn leaving dangerous chemicals in the eyes even longer. Skin cleansers on the market strip the skin of its natural oils, alkalinizing the ph leaving it unprotected and exposed to many chemicals, causing prematurely aging skin. The dry and tight “clean” feeling is not healthy. Source: Hoffman, Susan, herbalist. Skin Care Fact Sheet. 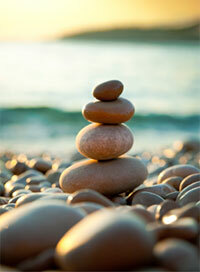 True Balance Wellness offers many natural skin care products balancing your skin using nature. Containing all-natural ingredients including medicinal herbs, the products simply work! Not only will you recognize all the ingredients, a 3rd grader can pronounce them. TBW also offers classes on how to create your own body care products including quick remedies using food in your kitchen. Call to schedule a class for your friends. Olive oil is very nourishing to the skin, rich in antioxidants and good fatty acids. Use as makeup remover, skin moisturizer, hair conditioner, cuticle treatment. Do not cook food with olive oil over 200 degrees (medium heat). Use coconut or grapeseed oil instead. Coconut oil which is useful in fighting free-radicals can be used for preventing liver spots/blemishes, keeps tissues strong to prevent sagging and wrinkles. Good hair conditioner, massage oil, foot smoother, lip balm, eye makeup remover and lash conditioner. Grapeseed oil nourishes skin particularly for oily skin. Potent antioxidants for anti-aging benefits. Useful for sun-damaged skin. Almond oil good for dry, aging skin. Good for use in massage. Rarely causes skin irritation. High in vitamin C and E.
Aloe Vera gel aids wrinkles. Can help stimulate growth of new collagen and elastin in the skin. Use as overnight spot treatment or mask. Can help heal pimples, calm redness and enrich your skin. Use with moisturizer to keep skin nourished but not oily. Acts as an astringent to clean the skin, an anti-inflammatory agent to calm the skin and a moisturizer. Facial Treatments: Plain Yogurt is a cleanser and mild exfoliating action using lactic acid instead of scrubbing granules. Removes dry skin naturally and leaves your skin feeling wonderful. Use alone or mix with a banana, apply to face and leave on for 20min. Other options, honey and mashed banana, or avocado. All very nourishing and high in vitamins and minerals. Body Scrubs: For dry winter skin, try a homemade skin scrub. Equal amounts of fine brown sugar and olive oil or another oil of choice. Rub on using light circular motions. Add a bit of honey for extra vitamins and minerals. Shower thoroughly after. Hair Treatment: For dry overworked hair, mix one egg yolk and 1 T liquid castile soap. Leave on 5-6 minutes to strengthen the scalp and possibly prevent hair loss. Or try 1 avocado with 2T warmed grapeseed oil and olive oil. Massage into hair, add shower cap for 15min. Longer hair may require doubling recipe. Honey is great for chapped skin. Apply to chapped lips, cracked heels and rough elbows before bed. A honey facial is very hydrating and nourishing. Treating your skin from the inside out, eat a diet rich in essential fatty acids, magnesium, vitamin C and beta-carotene. Some ideas may include: dark chocolate, salmon, fatty fish, oranges, mango, carrots.